I love your gentle sense of humour. Your explorations of the lessons alongside us help to quiet the monkey on my shoulder, somewhat. I really appreciate that. If nothing else, my hunger and the need to enjoy my own cooking artistry before it gets cold has the potential to motivate me to draw more quickly. Enjoyed this video immensely. Have had Felix’s book since October 2014 (how time flies) and every time I go back to it I find something new that I have not implemented. A lot of value in Sketchbook Skool Danny, sometimes we forget to stop being distracted. I thought about doing a can of sardines on Friday, lesson learned. Danny, you look very well, healthy and content in this video. I have enjoyed Felix’s lessons very much this week, especially the demo of him painting his lunch. Thanks again for Expressing. I have been enjoying your weekly videos. They have helped with some of the earlier sessions. 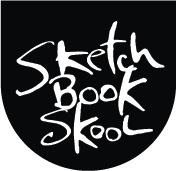 I just want to thank you for getting Felix to present in Sketchbook Skool. I have been watching his watercolor videos over and over again. They have really helped me to understand watercolor. There seems to be a lot to understand about watercolor. Cheers and thank you once more! Mmmmmm… art and the lunch! I particularly enjoyed the spreading of sardines on toast and the sound of your first big bite, that crunching sound followed by the softer chewing noises! The earlier rain sounds were good too, especially when suddenly the rain stopped so we could hear you speak! I must admit I nearly fainted when I saw you pick up a pencil! Did you erase too? Your application of paint was lovely to see, including demo of gray popping white! I’d say you got this lesson down well. I hope you do and share the next lesson as well, it’s a double your money kind of deal! Muchas gracias, Danny! How do I sign up for the lessons by Felix? Alas, you missed it, Eddie. I have been talking about Expressing for the past six weeks. Hopefully we’ll run the kourse again in the future. Sign up for our newsletter to stay informed. I love your work and pretty much everything you stand for. I never tire of perusing through “An Illustrated Life” and “Art Before Breakfast”. A lot of times drawing groups clamor over each other to draw LIKE THE MASTERS and impose rigid rules on things. I get why they do it but not really my thing. I hope he teaches a lot more at Sketchbook Skool – he’s so great! PS: I think your toast is really “scheinbergery”!